My book club held its March meeting at Cuchi Cuchi in Central Square in Cambridge. This was my first time dining at Cuchi Cuchi despite it being so close to my office. Now I am mad at myself for waiting so long to check it out. Cuchi Cuchi has a vibe all its own with ornate decor that is reminiscent of the roaring 20’s. An atmosphere that is only enhanced by the female waitstaff decked out in duds that reflect the era. The menu is made up mostly of small plates ($8-15) with influences from around the globe. There’s also a fabulous cocktail menu with a plethora of martinis and other mixed libations. We each ordered 2 small plates, which was plenty of food. I started with the Savory Coronets with Tuna Tartare and Avocado Mousse (3 for $13), which Cuchi Cuchi describes as “Our Signature dish with a nod to Thomas Keller, The French Laundry”. Thomas Keller is one of those chefs that I am just in awe of, so I had to order this. The three crispy cones stuffed with tuna tartare came served upright in a cute little rack. I loved the presentation and they were tasty, but not my favorite preparation of tuna tartare ever. I also ordered the beef stroganoff ($14), 3 chunks of sirloin with shallot and mushroom sauce served over egg noodles. The stroganoff was satisfying and filling, the perfect comfort food. To end our meal we ordered the French Banana Bread Extravaganza and the Cornucopia, a pizelle cone filled with fresh fruit, pureed mango, and whipped cream. I found the cornucopia to be a very refreshing way to end the meal…then mango puree acted as the perfect palate cleanser. I give Cuchi Cuchi 4 out of 5 mangoes. They are an ideal locale for a girls night out with a fun and funky atmosphere and creative cocktails. My foodie friend Rebekah was moving back to Buffalo from Boston and we decided to meet one weekday for lunch somewhere between my office and her apartment. We decided on MuLan. MuLan is located a couple of blocks up Broadway from The Garment District. It is located in the same building as Beauty’s pizza and the 2 places share a small parking lot with enough parking for about 5 cars. I was walking so I didn’t need to worry about parking… Good thing since the lot was already full. After a small wait, we were seated and given menus and some pickled veggies and peanuts. It took some prodding of the waitress to get some water and tea. But, we finally got some. The menu contains some authentic Taiwanese dishes along with some dishes you may be familiar with from Chinese restaurants. We decided to order a couple of dishes from the lunch specials to share. We ordered the kung pao shrimp and the lamb in hot chili pepper sauce. Both dishes were $7.95 and came with soup and rice. The kung pao shrimp contained chopped celery, water chestnuts, peanuts, dried red chili peppers and large shrimp in a mildly spicy sauce. It was very similar to kung pao dishes I have eaten at other Asian restaurants. The lamb was our favorite dish of the two. Thinly sliced lamb was stir-fried with julienned chili peppers and green bell peppers. This was one spicy dish! I would definitely order the lamb again. On another lunch visit, I had the shredded beef with dry bean curd. It was flagged on the menu as being spicy, but I didn’t find it that spicy at all. It was flavorful and filling. The service was similar on both visits… friendly, but a bit frenzied. On both visits, we needed to request water and tea. On some weekdays at lunch, there can be a wait to be seated. Their menu says they deliver so I will definitely have to order in some lunch with co-workers sometime soon. This week I met my friend Rebekah for lunch at Izzy’s in Cambridge. I walk there from my office in Kendall Square proper, and it was about a 10-15 minute walk. It was a really nice day out and the walk helped me release some work related stress. I had read a lot about Izzy’s on Chowhound.com in the Kendall Square lunch thread. Izzy’s is a small corner mom & pop sub shop that serves standard subs along with a number of Puerto Rican specialties. There are 10 or so tables to dine at but you place your order at the counter. Its very casual and the tables have Puerto Rico place mats under a layer of lucite and there are other homey, ethnic touches on the wall. We opted to share a number of the side dishes. We got the beef turnover, Jamaican patty, fish cake and sweet plantains. We also tried to order the cassava with garlic but they were all out. The order plus 2 soft drinks cost us under $10. Izzy’s is not the place to go for a healthy lunch, but if you are looking for stick to your ribs comfort food, this is your place. All of our food is a bit on the greasy side, but I had the walk to and from work to burn some of it off, so why not?? 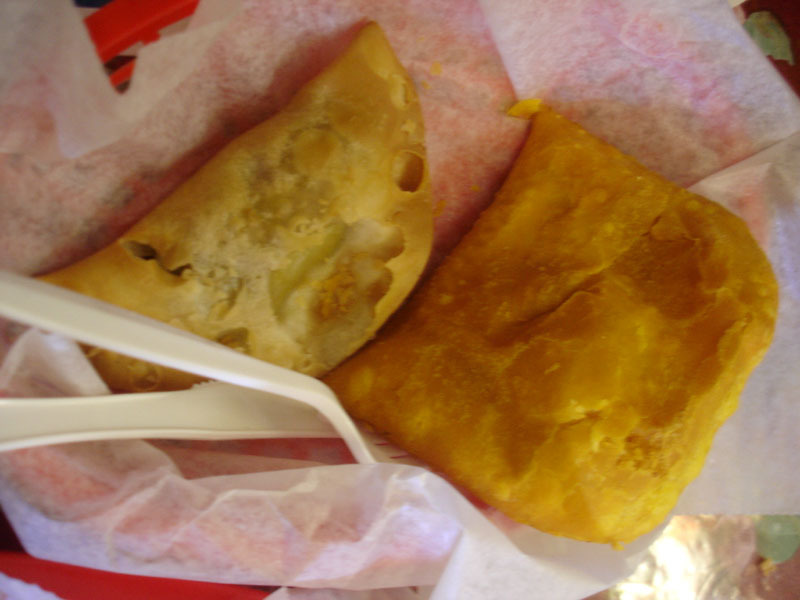 Our favorite was the Jamaican patty, which was a flaky crust filled with spiced ground meat. The beef turnover was quite similar but smaller. 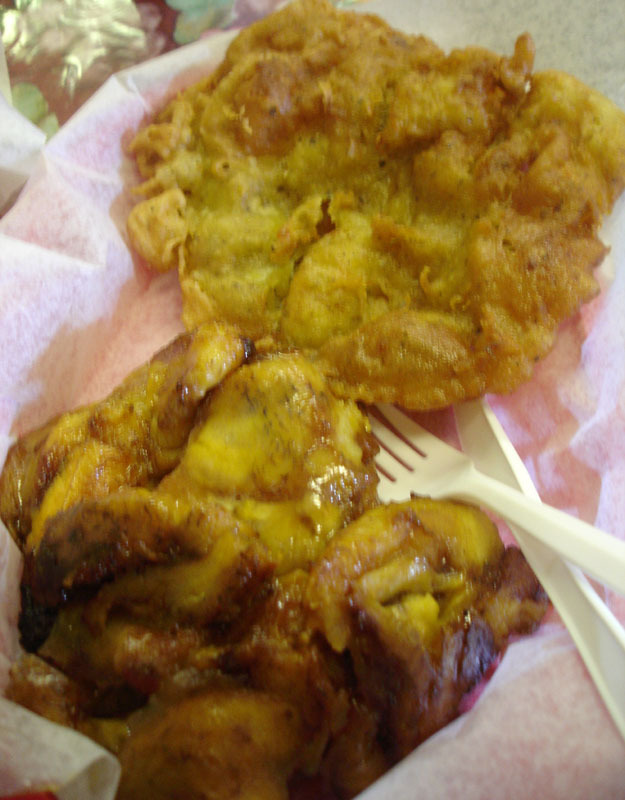 The plantains were nice and sweet, but also on the greasy side. The only dud from our order was the fish cake. Which was like fried dough with chunks of white fish in it. It was very oily and the dough was really crisp and the fish chunks were few and far between. I will definitely be back, maybe dragging a couple brave coworkers who don’t mind a walk. Next time I will try their goat stew or tripe soup and a homemade ginger beer.